In a land with so many cultures living side by side, you would expect India's desserts to be equally varied. Even the venerated vada or vadai - a type of fritter or donut - shows this spread of ideas. Here is a type made from urad dal, a type of black lentil that mashes nicely into a dough. Soak the beans in a few cups of room temperature water for several hours, until completely soft. Test by squeezing between the thumb and forefinger. The bean's skin should split easily, exposing the soft, white interior. Once the beans are softened, pour them into a food processor for pureeing. Add the seasonings (all but the baking soda) and blend until the mash is well mixed, then pour it into a large bowl. To fluff up the batter with air pockets, whisk for a minute. Now prepare the skillet. In a deep fry pan or wok, heat canola oil to 350°F / 175°C. Be sure to pour in enough oil to cover the donut well, allowing room for it to float as it cooks. That will mean filling to about three inches. Be sure to use a pan large enough so the oil is still well away from the top to avoid spilling over as you add the batter. Also, using much more oil than is needed simply to cover the vada ensures that it doesn't cool excessively when the dough is put in. Now add the baking soda to the batter and pour the thickened mixture into fritter or doughnut shapes. A hole is easy to make if you pour the batter around a basting dropper in a narrow, deep bowl. Or, you can prepare the dough and spoon out a hole afterward. For a fritter, tap the dough in your moistened hands a little bit. For a donut, leave as is. Add a few dough chunks to the pan, but leave plenty of room for each to float without touching once the oil has begun to sear the outside. Turn carefully about once per minute. Avoid tearing the donut or the fritter in half. The whole cooking portion should take no more than a few minutes. You can judge when they are done by the fact that they have been floating for at least 30 seconds. To test, extract one and use a fork to examine the interior. 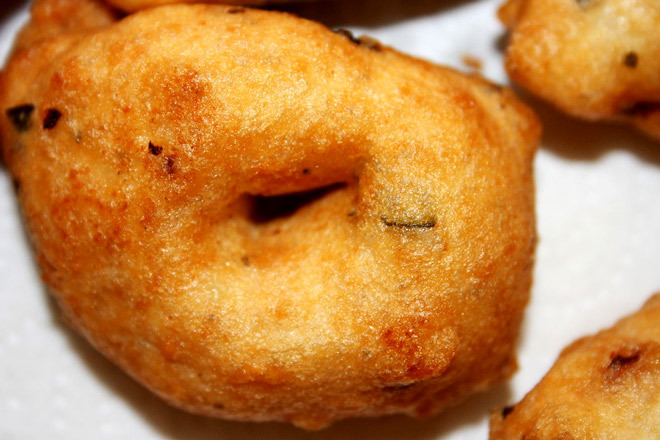 The vada should be crisp on the outside and well-cooked - doughy but not raw - on the inside. Once they're done, set them on a paper towel to drain excess grease and to cool. Individual cooking time for each piece will depend on the shape, fritters tend to be smaller and cook faster than doughnuts. Just as one example of this easy-to-prepare and scrumptious dessert, vada. Vada make excellent snacks warm or cool. They are especially delicious when served with a choice chutney spread. Preparation time does not include soaking of beans.